This pocket-sized book contains the complete Sanskrit text (in transliteration) of Shri Guru Gita as well as the chants and hymns sung before and after Shri Guru Gita in Siddha Yoga ashrams and meditation centers. The English translation is also provided. The size of this edition is convenient for travelers. 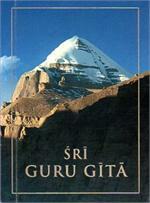 This pocket-sized book contains the text and Spanish translation of Shri Guru Gita. Book cover for the pocket edition of Sri Guru Gita chanting book. Sanskrit text of Shri Guru Gita.